The strap is surprisingly comfortable and the bezel has a really nice solid action to it. 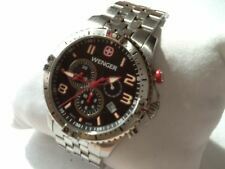 Pre-owned: Wenger Men’s Squadron Chrono Watch 77055 Silver Black dial. Wenger 01.0851.125 is equipped with a 22mm wide green textile and grey leather back strap with a buckle clasp. Manufacturer Wenger. Band Material Canvas/nylon, Leather. Case Material Plated Stainless Steel. Wenger 01.0853.110 is equipped with a 22mm wide green textile and grey leather back strap with a buckle clasp. Manufacturer Wenger. Swiss Army Knives. Features Chronograph, Rotating Bezel. Case Material Plated Stainless Steel. Wenger 01.0853.106 is equipped with a 22mm wide brown leather strap with a buckle clasp. Manufacturer Wenger. Band Material Leather. Case Material Stainless Steel. Case Size 45 mm. Wenger 01.0851.122 is equipped with a 22mm wide stainless steel bracelet with fold over clasp. Manufacturer Wenger. Band Material Stainless Steel. Case Material Stainless Steel. Case Size 45 mm. Swiss Army Knives. Original Swiss Army Stainless Steel Buckle. All Swiss Made 38mm Stainless Steel Case. Easily Fits Up To 8” Wrist. Perfect Mineral Crystals. Excellent, Clean, Ready To Wear Condition. Original Swiss Army Stainless Steel Buckle. All Swiss Made 38mm Stainless Steel Case. Easily Fits Up To 8” Wrist. With New Quality Croc Leather Strap. Perfect Mineral Crystals. Excellent, Clean, Ready To Wear Condition. Wenger 01.0853.109 is equipped with a 22mm wide black silicone rubber strap with a buckle clasp. Manufacturer Wenger. Band Material Rubber. Case Material Plated Stainless Steel. Case Size 45 mm. Wenger 01.0853.107 is equipped with a 22mm wide solid stainless steel bracelet with a fold over clasp. Manufacturer Wenger. Band Material Stainless Steel. Case Material Stainless Steel. Case Size 45 mm. Wenger 01.0851.120 is equipped with a 22mm wide red stitched black leather strap with a buckle clasp. Manufacturer Wenger. Band Material Leather. Case Material Stainless Steel. Case Size 45 mm. Wenger 01.0853.105 is equipped with a 22mm wide red stitched black leather strap with a buckle clasp. Manufacturer Wenger. Swiss Army Knives. Band Material Leather. Case Material Stainless Steel. Case Size 45 mm. AUTHORIZED WENGER DEALER. Manufacturer Wenger. WATCH BOX. Sapphire coated mineral crystal. Band Material Leather. Watch Shape Round. Case Color Silver. Band Color Brown. Wenger's Attitude watch collection makes no secret of its innate dynamic character, with an exuberant vitality combined with an active lifestyle. Swiss Made. Water resistance 10 ATM/100 M/330 FT. Luminous Hands. AUTHORIZED WENGER DEALER. Manufacturer Wenger. 22mm band width. WATCH BOX. Band Material Silicone/Rubber. Band Color Black. Watch Shape Round. Case Color Silver. AUTHORIZED WENGER DEALER. Manufacturer Wenger. Analog display. Display Analog. WATCH BOX. Band Material Faux Leather. Watch Shape Round. Band Color Brown. AUTHORIZED WENGER DEALER. Manufacturer Wenger. WATCH BOX. Stainless steel case material. Band Color Orange. Watch Shape Round. Case Color Black. Case Material Stainless Steel. AUTHORIZED WENGER DEALER. Manufacturer Wenger. 22mm band width. WATCH BOX. Band Material Stainless Steel. Stainless steel case material. Band Color Silver. Watch Shape Round. Display Type﻿: Analogue. Clasp Type﻿: Buckle. Band Material: Leather. Band Colour: Black. Dial Window Material Type﻿: Mineral. This watch features chronograph function. Water Pressure Resistance: 10 bar. Box Contains WATCH INCL. WARRANTY CARD. Display Type﻿: Analogue. Clasp Type﻿: Buckle. Band Material: Leather. Band Colour: Brown. Dial Window Material Type﻿: Mineral. Water Pressure Resistance: 10 bar. Dial Window Material Type : Mineral. We will do our best to turn any less than satisfactory experience into a positive one. Band Length : standard length. Model Year : 2016. Weight : 132 Grams. Our service and products are of the highest quality! It is fastened with a red fabric strap and has a black dial. The watch also has a date function. Dial Window Material Type﻿: Mineral. Boxed-product Weight: 259 g. Model Year: 2016. Weight: 59 Grams. Swiss-made quartz city classic watch with sapphire coated mineral crystal. Luminous hands. Australia, Belgium, Brazil, Canada, Croatia, Denmark, Estonia, Finland, France, Germany, Gibraltar, Great Britain, Hong Kong, Hungary, Ireland, Israel, Italy, Japan, Latvia, Lithuania, Luxembourg, Malaysia, Malta, Netherlands, New Zealand, Portugal, Singapore, South Korea, Spain, Sweden, Switzerland. Wenger 01.1421.112 is equipped with a 17mm wide black stitched genuine black leather strap with a buckle clasp. Swiss-made quartz city classic watch with sapphire coated mineral crystal. Luminous hands. Wenger 01.1421.103 is equipped with a 17mm wide black stitched genuine black leather strap with a buckle clasp. Swiss-made quartz city classic watch with sapphire coated mineral crystal. Luminous hands. Item model number: 72803. Date display. Australia, Belgium, Brazil, Canada, Croatia, Denmark, Estonia, Finland, France, Germany, Gibraltar, Great Britain, Hong Kong, Hungary, Ireland, Israel, Italy, Japan, Latvia, Lithuania, Luxembourg, Malaysia, Malta, Netherlands, New Zealand, Portugal, Singapore, South Korea, Spain, Sweden, Switzerland. Australia, Belgium, Brazil, Canada, Croatia, Denmark, Estonia, Finland, France, Germany, Gibraltar, Great Britain, Hong Kong, Hungary, Ireland, Israel, Italy, Japan, Latvia, Lithuania, Luxembourg, Malaysia, Malta, Netherlands, New Zealand, Portugal, Singapore, South Korea, Spain, Sweden, Switzerland. The textured center of the dial resembles a jersey design, making this the ultimate in sporty style for the man on the go. Australia, Belgium, Brazil, Canada, Croatia, Denmark, Estonia, Finland, France, Germany, Gibraltar, Great Britain, Hong Kong, Hungary, Ireland, Israel, Italy, Japan, Latvia, Lithuania, Luxembourg, Malaysia, Malta, Netherlands, New Zealand, Portugal, Singapore, South Korea, Spain, Sweden, Switzerland. Swiss-made quartz sea force watch with sapphire coated mineral crystal. Water resistant 200m (660ft): in general, suitable for professional marine activity and serious surface water sports, but not diving. Swiss-made quartz city classic watch with sapphire coated mineral crystal. Luminous hands. If we have made a mistake we will always rectify it. Australia, Belgium, Brazil, Canada, Croatia, Denmark, Estonia, Finland, France, Germany, Gibraltar, Great Britain, Hong Kong, Hungary, Ireland, Israel, Italy, Japan, Latvia, Lithuania, Luxembourg, Malaysia, Malta, Netherlands, New Zealand, Portugal, Singapore, South Korea, Spain, Sweden, Switzerland. Wenger 01.1043.113 is equipped with a 22mm wide black stitched genuine black leather strap with a buckle clasp. 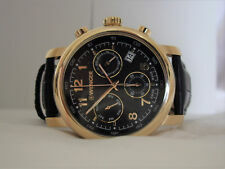 30 minute chronograph. Australia, Belgium, Brazil, Canada, Croatia, Denmark, Estonia, Finland, France, Germany, Gibraltar, Great Britain, Hong Kong, Hungary, Ireland, Israel, Italy, Japan, Latvia, Lithuania, Luxembourg, Malaysia, Malta, Netherlands, New Zealand, Portugal, Singapore, South Korea, Spain, Sweden, Switzerland. Wenger 01.1421.106 is equipped with a 17mm wide solid stainless steel bracelet with a fold over clasp. Swiss-made quartz city classic watch with sapphire coated mineral crystal. Luminous hands. If we have made a mistake we will always rectify it. Wenger 01.1421.104 is equipped with a 17mm wide solid stainless steel bracelet with a fold over clasp. Swiss-made quartz city classic watch with sapphire coated mineral crystal. Luminous hands. If we have made a mistake we will always rectify it. Wenger 01.1421.101 is equipped with a 17mm wide black stitched genuine black leather strap with a buckle clasp. Swiss-made quartz city classic watch with sapphire coated mineral crystal. Luminous hands. Add to your favourite look with a wenger automatic quartz movement men's watch. Bolder than other styles, these men's watches typically have large faces. They also have low-maintenance designs, making them ideal for anyone with an on-the-go lifestyle. The movements are renowned for their accuracy and precision, making these watches exceptionally reliable. Solid gold bands are resistant to corrosion for added durability. Entirely made of gold, the bands are highly precious and beautiful. Polyurethane band wristwatches are pleasant to wear. They have lightweight designs, making them especially comfortable to wear during any activity. With their modern styles, stainless steel case wristwatches are great for updating your everyday outfit. Built with scratch-resistant designs, they are unlikely to get damaged by accidental drops. With traditional styles, brass case wristwatches are versatile accessories for a night out. These watches are highly resistant to corrosion for long-lasting durability. Binary watches display the time in a bar graph with zeros and ones. They are typically designed with backlighting, so you can easily read the time in poor lighting conditions. LED watches are easy to read. Generally designed with a quartz crystal and a tiny digital computer in order to keep track of the time, they are extremely accurate.